The Southwest Florida Kayak Anglers Association has a great website where they post club news and fishing reports along with some well written gear reviews. 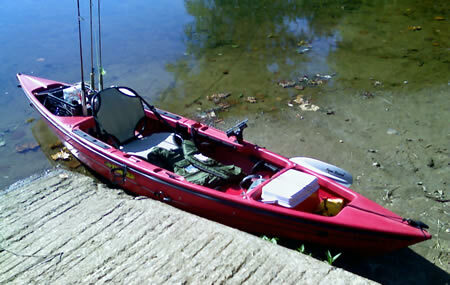 Jim Van Pelt posted this review last month about one of my favorite fishing kayaks, the Native Watercraft's Ultimate 12. Yesterday May 1, 2011, I fished in the IFA’s Sarasota Redfish and Trout Tournament. Earlier in the week my Wilderness Systems Tarpon 120 sprung a leak in the keel which is something I’ve been battling with since I bought it used back in September. Jory Pearson from Florida Paddle Sports on Pine Island Road in Cape Coral, FL came to the rescue. He provided me with a Native Water Craft Ultimate 12 so that I could get out onto the water and catch some fish. From the moment I picked it up at the shop I was immediately impressed with how light it was. It’s only half the weight of my 12 foot sit on top kayak and has more than 3 times the amount of storage. I brought all of my normal fishing equipment and still had room for a full size cooler and extra tackle. We got out on the water at about 6:30 am and the wind was already ripping across Pine Island Sound and the higher sides of the Ultimate got caught by the wind and we got pushed pretty quickly across the flats. I noticed that when caught in the wind the Ultimate spins while it drifts which is an easy fix with the addition of a rudder system. Along the way we fished the all of the pot holes and caught a number of Sea Trout, all of legal size. Fishing a tournament and trying to measure a fish and keep it in the boat can be a bit of a feat, but the sides of the Ultimate completely remove this issue, keeping a lively fish securely inside your boat at all times while you try to simultaneously measure and take a picture. Once across the Sound and out of the wind I was able to comfortably stand and use a push pole to navigatemy way through the grass flats while looking for tailing Redfish. The boat was extremely stable, I was even able to hook and land fish while standing and being pulled. After a few hours hunting Reds it was time to pack it up and race back to Sarasota for the weigh in. Neither I nor my partner was looking forward to the paddle back because we had to paddle against the wind and the current. I was extremely surprised at how easy the paddle back was and how well the boat tracked in strong winds and a rough chop. I was also extremely pleased that I was able to manage a full 6 hours of fishing that day due to how comfortable the seating system in the Ultimate is. After yesterday I can’t wait to get into an Ultimate on a more permanent basis, maybe just upgrade to the bigger 14.5ft model. I could spend all day fishing and paddling or standing and poling the flats. Minus the few minor tweaks that would be needed such as a few more rod holders, which does come standard on the Angler model, and a rudder system which would be a must, this is definitely a great boat and worth a try. It made tournament day much more enjoyable. For more information on all Native Watercraft click here.